In just two weeks of launching the Impact Series Competition for the existing Npower beneficiaries, the support team has received a dozen videos from beneficiaries across the nation. Remember, the support team has thrown in the air a 37 million naira challenge among the volunteers and they’re expecting a beneficiary from each state to catch a million naira. Contestants have already been making their videos and submitting them to the team. These videos can be found under the dedicated Twitter handle. 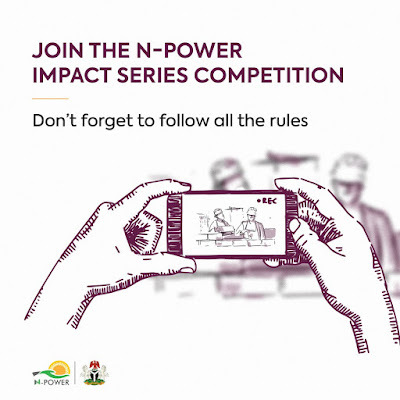 In case you an existing beneficiary and you wish to take part in the ongoing competition, all it requires is a minute video and some sharings on the internet. The share on other social channels such as Facebook, Instagram etc. Be sure you add the hashtag #ThisIsNPower. This is the only way the team will be aware that the traffic is coming from your video. Having said that, some critics believe Federal government is doing all these to lure Nigerian youth to voting for the APC administration comes 2019 general election. What is your view on this? Share with us in the comment section below.